So excited. 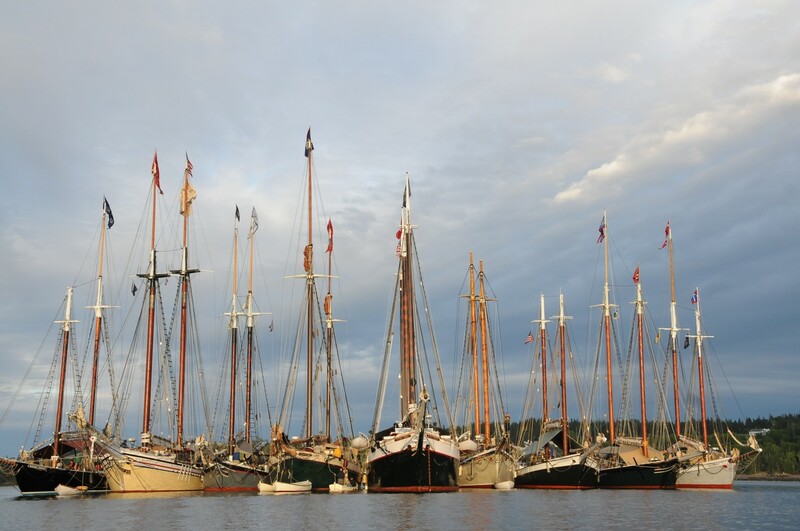 I’m heading out to sail aboard the Victory Chimes for the Maine Windjammers Association’s 37th Annual Great Schooner Race, July 5, in Penobscot Bay. Our Maine windjammer cruise leaves from Rockland harbor this Sunday, June 29, and we participate in all the things that make this experience so unique – lobster bake on a secluded beach, visiting small fishing villages, scanning the sea for seal and dolphin. It’s a folksy, Americana sort of trip that is basically unique and makes for a very special experience, whether for a family, a couple, a gal-getaway, multi-generational getaway, reunion or groups of friends who want an atmosphere that promotes camaraderie. You can help sail the ship or just enjoy the cruise. Stop by and tour Maine’s legendary windjammers at their docks each afternoon from 2:00-4:00 pm. The participating windjammers can be found at North End Shipyard and Windjammer Wharf (off Tillson Ave) in Rockland; the Public Landing in Rockport; and at the head of the inner harbor in Camden. Hope you can join us! The entire fleet participates in an afternoon Parade of Sail past the mile-long Rockland Breakwater, providing spectators with stunning, close-up views of Maine’s fleet of tall ships. More than a dozen groups perform traditional music of the sea on Swans Island, with live shipboard performances as well. Festivities include a parade of sail, maritime heritage fair, contra dance, fireworks, lobster crate race, chowder challenge, free concerts, schooner crew talent show, family scavenger hunt, outdoor movies and more. The fall gathering of the fleet takes place in Brooklin, Maine, headquarters of WoodenBoat Magazine and WoodenBoat School. Live music, local refreshments, boatschool tours. The different ships also hold theme cruises – reflecting the interest and personality of the captain – from photography to bird-watching. Victory Chimes has scheduled its inaugural four-day “Maine Story & Humor Cruise” for July 14-18. and a four-day Maine Geology Cruise Aug. 16-20. 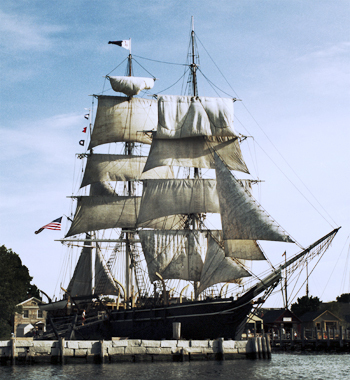 The fleet of 10 ships includes numerous historic rigged vessels, many which have been named National Historic Landmarks, fully restored and beautifully maintained with the many comforts of home for today’s savvy traveler. A trip aboard one of these schooners is a great way to experience Maine and its coastal towns, with true working waterfronts satisfying those with a taste for life on the sea. Each ship has a distinct personality and character – largely because of the captain but the architecture and the “story” of each of the vessels, as well. And each cruise is always different based on the serendipitous confluence of who the other passengers are – an esprit de corps forms during the sail – the weather, and myriad other factors that can never be anticipated or planned. Aside from the Great Schooner Race, while aboard one of the schooners, guests spend about six hours each day under sail, meandering through the waters of mid-coast Maine, and every afternoon drop anchor in the safe, snug harbor off a quiet fishing village, or at an uninhabited island where they can go ashore and explore. 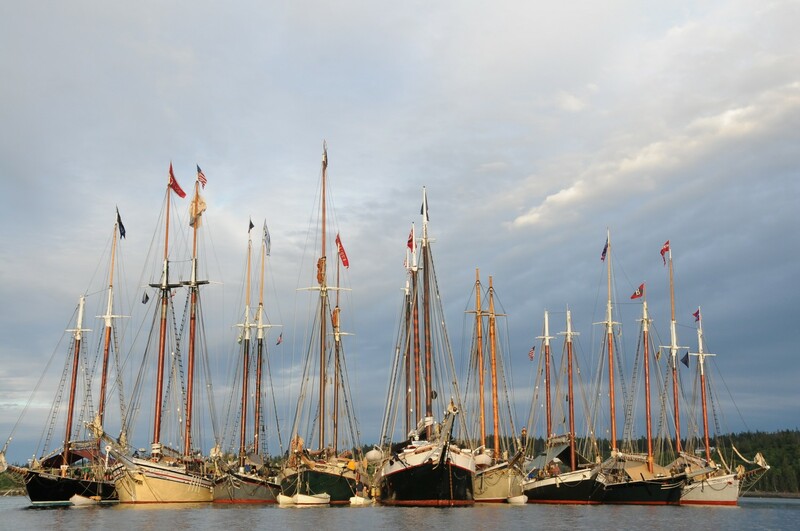 The Maine Windjammer Association is comprised of the largest fleet of traditional sailing schooners in North America. Built in the USA, all 10 Windjammers are individually owned by U.S. Coast Guard-licensed captains who work together to ensure the highest standards of safety, comfort and professionalism. The windjammer fleet hails from ports of Rockland, Rockport and Camden, located in the mid-coast region of Maine. Each windjammer carried between 20 and 40 guests and 3-10 crew members. Windjammer cruises are for people of all ages. For brochures and DVD, or for information, contact the Maine Windjammer Association at 800-807-WIND; or visit www.sailmainecoast.com. Celebrating boating and boatbuilding, the new Penobscot Bay Rendezvous Regatta is a 4-day premier boating event, filled with daily races, Poker Run and Photo Pursuit events, lobster bakes, fireworks and so much more on August 18-24, 2011. The Rendezvous will feature daily races for both power and sail boats, on-water spectator yachts, BBQ, lobster bakes, fireworks, and more. 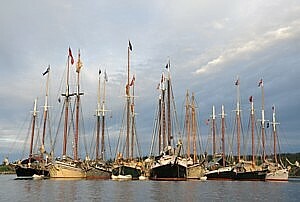 A full schedule of events can be found here: http://www.penobscotbayrendezvous.com/node/2 The local Windjammers are also expected to participate and will be arriving in Camden and Rockland harbors that weekend as well. “Maine’s vast coast, scenery, and boating enthusiasm makes it the perfect place for an event of this kind and the Mid Coast Region of the state is the ideal location with its Windjammer history, boating culture and spectacular viewing spots,” says Dan Bookham, Executive Director of the Camden-Rockport-Lincolnville Chamber of Commerce who are assisting with the logistics of the weekend. With the geographic layout of the area, event spectators will be able to see all of the action from the land or can catch spectator-assigned yachts to see the races from the sea. The Camden-Rockport-Lincolnville Chamber of Commerce is a non-profit membership association that seeks to promote the interests of business and encourage economic development. 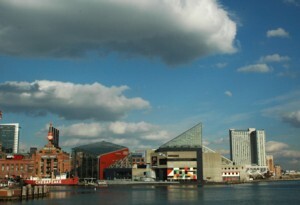 For more information visit the Chamber at www.camdenme.org or email chamber@camdenme.org.